What are the York Rite Degrees? Who can I contact about York Rite Masonry Closest to me? Well, the snow is finally melted and so it is time once again Companions to start laboring in North Star Chapters quarry. As stated in Companion Sheridan’s address above, we have a meeting coming up on the 27th and I plan on preparing a supper beforehand. If this goes well, we will start instituting a meal before every meeting, so please come out and support your York Rite Bodies and enjoy some fellowship in the process. As usual, we will be conducting our regular business on the 27th, however, I plan on scheduling a Mark Master Mason Degree (and practices) that evening. That being said, the Chapter would appreciate your attendance so potential date conflicts with the degree can be minimized. We have had a great growth in the North Country over the last several years and continual participation of all the Companions is one way we can insure that that growth will endure. The Annual Meetings of the three York Rite Grand Bodies are now history. We have a few of our own members now sitting in active chairs of those Bodies. RE Comp. Phillip J. Beiner, our High Priest, was elected to the position of Grand Scribe in the Grand Royal Arch Chapter of N.H. Comp. Paul M. Leary was appointed as Grand Chaplain and Comp. David S. Collins is the new Grand Sentinel of that Body. Comp. 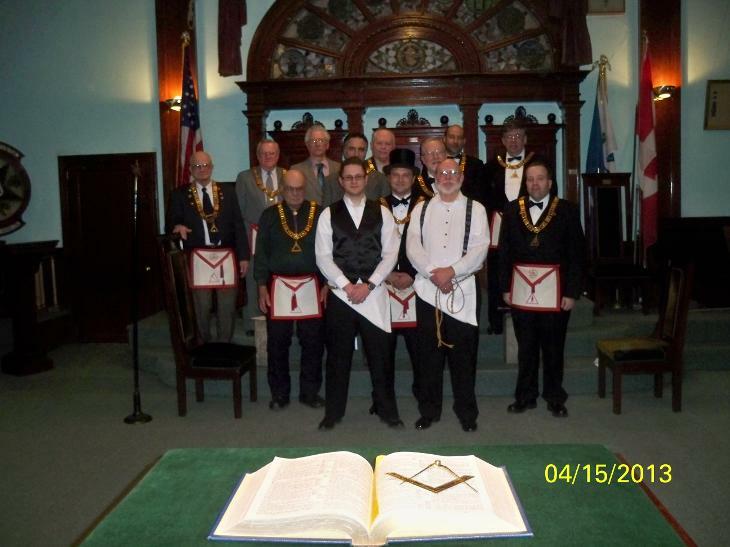 Leary is also the Grand Chaplain for the Grand Council Cryptic Masons of NH and Comp. Collins is the new Deputy Grand Lecturer. Of note is Comp. C. Jarvis Lewis, Jr. continues to serve as Grand Chaplain of these Bodies and I remained as Grand Secretary-Grand Recorder. In the Grand Commandery, Sir Knight Leary won the election and is now the VE Deputy Grand Commander, SK Collins has accepted the appointment of Grand Sword Bearer and I have remained as Grand Recorder. SK Jeremy W. Allin has accepted the position of Grand Warder. You can see that the North Country is well represented in the Grand Bodies. Our next meeting of the combined York Rite will be in Lancaster on Tuesday May 27, 2014 starting with a complimentary supper at 6:30 p.m. It is planned to open Chapter at 7:00 p.m., Council at 7:30 p.m. and Commandery at 8:00 p.m. These are Stated Meetings for all three Bodies and the Annual Meeting for the Commandery. Please come visit with us congratulate your new Grand Officers.